Weinberg sophomore Samantha Flood speaks Monday at the one-year memorial of Mohammed Ramzan’s death. Ramzan died last April during crew practice after falling off a nine-person shell. As a group of students gathered Monday for the one-year memorial of Mohammed Ramzan’s death, Samantha Flood fondly recalled the special bond she shared with Ramzan. 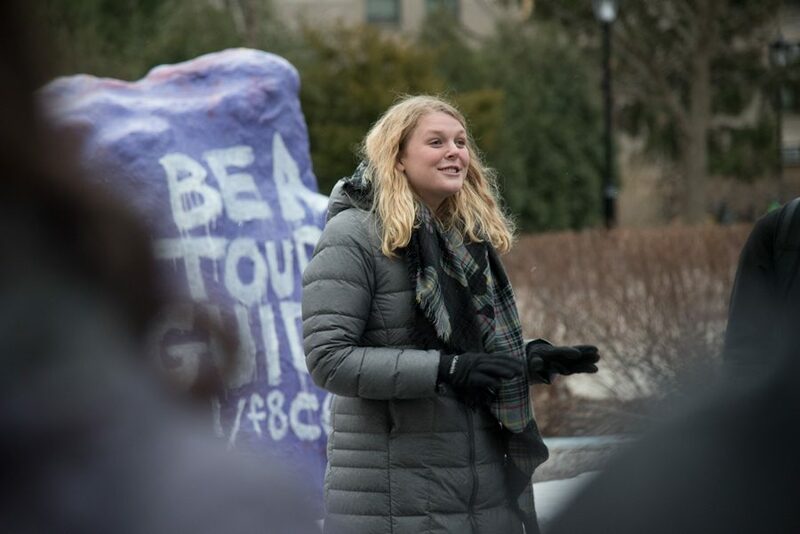 “Even though we were friends for only six months … you meet that one person in your life and you know –– you know that nobody else will compare,” the Weinberg sophomore said. Ramzan died last April during crew practice, after he fell off a nine-person shell on the North Shore Channel in Lincolnwood. About 30 people gathered in front of The Rock on Monday to share stories of how Ramzan had touched their lives. Flood said she was “infatuated” by Ramzan when she first met him. It was inspiring to see another low-income, first-generation student diligently pursue his dreams, she said. She also admired how he showed pride in his identities as gay and Muslim. Weinberg sophomore Abby Wolfe, who used to row with Ramzan, said she was constantly amazed by Ramzan’s optimistic attitude. The two first bonded over having asthma, she said. But unlike her negative attitude toward her condition, Ramzan was excited to row and improve his health, she said. SESP sophomore Christopher Mayorga said he first met Ramzan through QuestBridge, and they had gotten to know each other virtually during their senior year of high school. Both online and in real life, Ramzan had always shared his positivity and had a lot of compassion toward others, Mayorga said. After Ramzan’s death, McCormick sophomore Fatima Alkhunaizi said she tried to move on from the tragedy and focused on forgetting painful memories. Now, however, she said she realizes there is a lot for her to learn from Ramzan’s life, including his positivity and determination. Alkhunaizi said she admired that Ramzan took matters in his own hands when he faced obstacles. When he was unhappy, he redirected his life by taking an off-campus job and exploring different options for himself, she said. He was never let down about being a first-generation, low-income student and had a positive outlook on his future, she said. Alkhunaizi said events like Monday’s memorial are healthy because they remind loved ones to remember the beauty of Ramzan’s life.